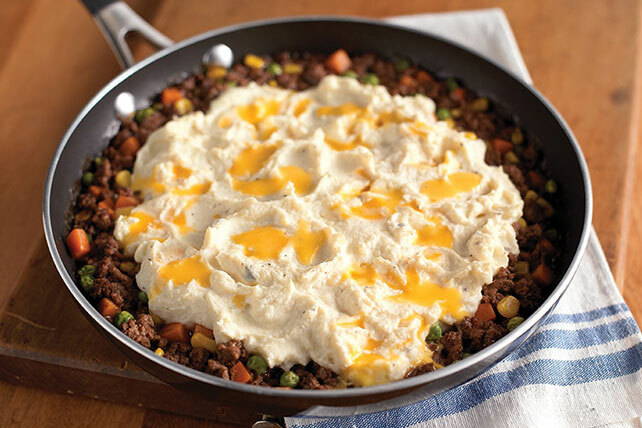 If you like shepherd's pie and you like easy skillet dishes—well, you'll like this recipe. Ground beef, cheese, corn and taters, all in one pot! Brown meat in medium ovenproof skillet; drain. Return meat to skillet; stir in frozen vegetables and gravy. Substitute breakfast pork sausage for the ground beef. Wrap skillet handle with several layers of foil before using as directed.